You may remember that in 2010, a fire broke out at Casa Alianza Mexico, leaving children who had been rescued from the streets feeling vulnerable and uncertain about the future. Casa Alianza Mexico was unable to restore the existing building and unable to relocate to another site big enough for all the children, which meant having to operate out of a number of sites across the city. We now have some exciting news to share with you! 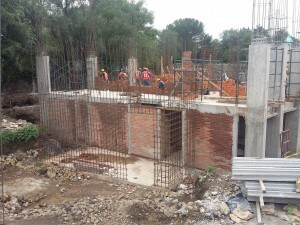 Casa Alianza Mexico has managed to sell the old site and with the proceeds, have purchased some land and are constructing a custom built site to bring all services under the same roof. The proposed site will be state of the art, enabling the staff to be even more effective and provide services to many more children in need. There will be more space, an increased number of facilities including 6 residential homes, classrooms for onsite education, multimedia facilities to teach skills for life, sports facilities, green space for the children to exercise and relax and a comprehensive health clinic to support the physical and emotional needs of the children. It is a massive undertaking but will be hugely beneficial to the children, both now and in the future. We will keep you updated on how the work is progressing.